Last week we checked out Pretend We’re Stars, the lead single from space wave enthusiasts Astronomique’s Burning Stars Fade EP. We absolutely loved the track, and very much looked forward to hearing more sounds that sound like they came from other planets and were delivered in the most pleasant, catchiest ways possible. Pretend We’re Stars gave us a strong first impression and an idea that the rest of the material on Burning Stars Fade was going to be full of simple catchy drum beats and huge levels of synth-driven instrumentals that would swell and expand into vast atmospheric tunes. The lead single shows off many catchy elements from the embedded guitar melodies to the sweet sounds of the vocals, and Astronomique certainly continue that trend on the EP. Opening track Shaded Grey sets off the record with an immediate hook that kicks the listener in the stomach and throws all kinds of fuzzy basslines and drumbeats on top of them. It’s a very catchy listen that sits comfortably in the darkness but is not afraid to produce some sweet melodies and is confident to throw out some pop elements too. What’s also great about the EP is how Astronomique succeed at making their sound actually seem like it fits the vast unknowing of space. Each of the five tracks featured sound like they have endless opportunities for layers of guitars and bass and vocals to contribute something worthwhile and there’s many occasions where certain songs continue to expand and provide the listener with additional sounds when it just seemed impossible to expect to more from it. It’s awesome, and it definitely makes returning to Burning Stars Fade a much easier task. Painting Silhouettes is a fantastic example of the aforementioned gathering of layers as the song takes on all kinds of different synth and guitar melodies that somehow sink their way into the airwaves without a hint of disruption in the continually smooth flow of the EP. The vocals do a great job of keeping things grounded while the instrumentals are free to explore all kinds of pockets to produce something that always sounds original yet very accessible. 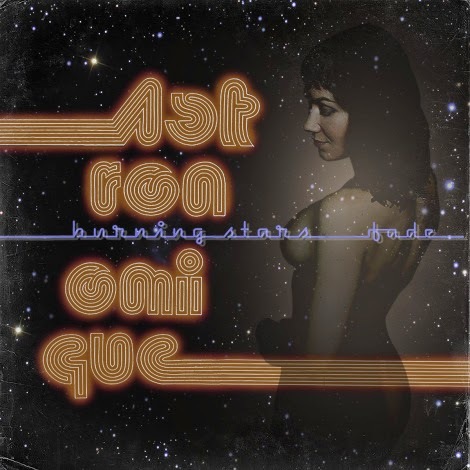 Burning Stars Fade is a fantastic debut from Astronomique. Not only do these guys introduce themselves to the masses but also deliver a new sound that hasn’t been heard too much lately and it sounds pretty freaking good. Stream the EP below, and for more music reviews and teehee, there’s a naked lady on the cover. Check out Exploding Head Syndrome on Facebook and Twitter.